Is it Just Britain that Recognizes the Greatness of Winston Churchill? The fact that his funeral was held the Cathedral of Saint Paul in Rome (Gould, Peter (2005-04-08), says that the greatness of the British Prime Minister acknowledged by the whole world . But and during his lifetime, Winston Churchill received many awards, titles and academic degrees as a British army officer, politician, writer and scientist. 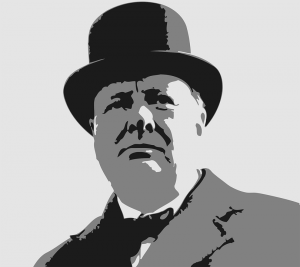 During the service in army and stint as a prime minister W. Churchill received 37 awards and other honors: 20 of them from the United Kingdom, 10 during his military service in India, Cuba, Egypt, South Africa, was also awarded in countries such as: Belgium, Luxembourg, the Netherlands, Denmark, Spain, Czech Republic, Estonia, Libya, Nepal, Norway and the USA (The Churchill Centre). In 1955, after the resignation from the post of Prime Minister Winston Churchill has been proposed the title of Duke of London, and from that time it became known as Sir Winston Churchill. The title of Duke In London were entitled just the members of the royal family and therefore this proposal once again underlines its significance for Britain and the respect of the British Society. In 1956, Churchill received the Karlspreis (known in English as the Charlemagne Award), an award by the German city of Aachen to those who most contribute to the European idea, and European peace. In 1953 he received a Nobel Prize in Literature “for his mastery of historical and biographical description as well as for brilliant oratory in defending exalted human values” (Literature1953, 2009/08/09). In 1964, Civitan International presented Churchill its first World Citizenship Award for service to the world community. During the stint as a stint as a Prime Minister, Churchill was the Man of the Year in 1940, a man of half a century, in 1949 and in 1945 applied for a Nobel Peace Prize. And in 2002, BBC TV viewers and web site users voted him the greatest Briton of all time in a ten-part series called Great Britons, a poll attracting almost two million votes (BBC 05/14/2006). In 1963, US President John F. Kennedy , acting under authorization granted by an Act of Congress, proclaimed Churchill the first honorary citizen of the United States (Plumhton,1988). In honor of Winston Churchill called a large number of streets, parks, schools, in almost all English-speaking countries and former colonies of the British Empire. In his honor, called aircraft carriers, destroyers, ferry boats, fighter jets, tanks, submarines, railways. With its image of minted coins, and even there the champagne “Pol Roger ‘s prestige cuvÃ©e” was named after him. The name was accepted by his heirs as Churchill was a faithful customer of Pol Roger. Following Churchill’s death in 1965, Pol Roger added a black border to the label on bottles shipped to the UK as a sign of mourning (Roger P. 2010/12/07/). Such an abundance of awards, prizes and achievements shows that Winston Churchill was indeed an outstanding personality and it is recognized not only in Britain but also in most countries of the world, and recognizing to this day. This man is quite right to claim the title of Man of the Century for his services to humanity! The Churchill Centre (2012) The Orders, Decorations and Medals of Sir Winston Churchill. Retrieved from http://www.winstonchurchill.org/? Plumpton, John (Summer 1988). “A Son of America Though a Subject of Britain” Finest Hour (60). What do you need to become inspired and write a fascinating history essay, looking more like a new best-seller story, than an ordinary assignment? Of course, you need an impressive example of history paper. Very often students perceive history as a collection of facts and names that are hardly connected, and need to be learned by heart. We will prove you that this belief is completely wrong! You can find great writing advice and sample essays at our blog. And it this won’t be enough to change your point of view, place your order to receive an example of history paper that will change the way you look at this subject once and forever.